The Stamp Gallery is thrilled to announce our newest exhibition: Patterns of Movement by Tara Rodgers (July 23rd – August 24th). This multifaceted and interactive exhibit features a complex and technical exploration of sound and visuals captured by composer and sound artist, Tara Rodgers. We had the pleasure of interviewing Rodgers regarding her creative process. You have traveled to several locations for your installations. Many venues for exhibitions add an accidental influence on how an artist’s work is interpreted to audiences. Which location haunted your work the most? Do you feel the space your work is translated in has a direct impact on your audiences? Back to your question: The first time I presented “Butterfly Effects,” inside the Mills chapel, some of the doors and windows were ajar and the traffic on the highway created a nice, unplanned interaction with the noise elements in the piece. Likewise, when I played jazz piano at a cocktail lounge in New York, on warm nights we would leave the doors open and passersby would sometimes stop and listen, sometimes dance on the sidewalk for awhile and then move on. That was lovely: extending an unamplified performance into the larger time and space of the city. When I perform house and techno music in clubs, I especially enjoy the challenges of tweaking tracks produced in a home studio for a much bigger sound system, and the surprise of how that sound changes when a cavernous space is empty during sound check, vs. when it is full with bodies later in the evening. These are interesting technical challenges to resolve, and also can be wonderfully dynamic and affective. My memory of the most sonically dramatic instance of this is from a performance at the Empty Bottle in Chicago. What sorts of technology do you use to execute your projects? I like to find and use tools that are well suited to a particular task. I also like working with different tools in projects that are going on simultaneously, in order to challenge myself to adapt and work in new ways. So, for example, right now I have a few areas that I’m working in. I use the programming environment SuperCollider for the kinds of data-based and generative compositions shown in this exhibition. SuperCollider is very well suited to real-time transformations of sounds, offering great subtlety in sonic detail and the possibility of constructing elaborate compositional systems. When I compose techno, I work with hardware synthesizers and drum machines that were either made in the 1980s or ‘90s, or that emulate those now classic designs. One can make this music with software, but these hardware instruments are so thoroughly integral to that genre of music, I feel that an important part of the craft of making that music is to learn these instruments inside and out. Separately, I’ve also been making improvised noise music with small, analog synthesizers. Each of these has particular quirks that characterize the tones and patterns they generate, so when you play with two or three of them simultaneously, it is inevitably an unpredictable result. I am intrigued by the ways that these analog synths are each unique–the antithesis of digital instruments or objects which extend the promise, at least, of replicability. You recently wrote “Pink Noises”, a book that brings together twenty-four interviews with women involved in electronic music and sound cultures and explores their personal histories, creative methods, and the roles of gender in their work. How has the process of writing this book affected your artwork? Do your writing and your art share similar themes? The process of writing Pink Noises emerged out of my music and soundmaking activities. The project began as a website that launched in 2000, which I created to document the work of women in electronic music and to make resources on music production more widely available to women and girls. The process of compiling interviews for the website, and later for the book, followed my own travels as a practitioner through various electronic and experimental music scenes. 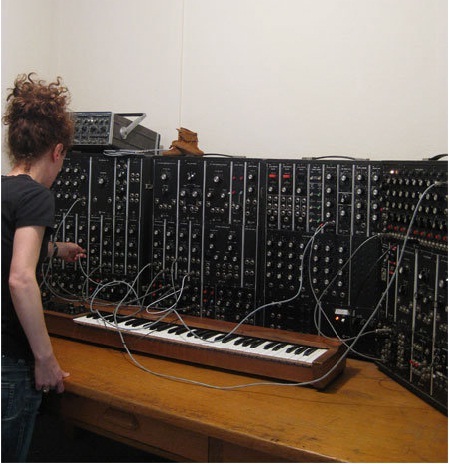 The people I interviewed in the book were typically mentors, colleagues, collaborators, friends; so, Pink Noises can be understood as a historical document of an extended network of women making electronic music and sound art at a particular moment in time (the early-’00s, when the interviews were conducted). Its primary influences on my artwork have been the opportunity to launch ongoing conversations with a range of women working in these fields, and to understand how my work unfolds in the contexts of this community and its many historical trajectories. My artwork continues to generate questions that drive my writing; I am currently researching a cultural history of synthesized sound, investigating the century before synthesizers were made commercially available. Here, I am interested in the cultural roots of common terms and tools in contemporary electronic music production–such as the “waveform” and “amplitude envelope.” I am thinking about how these terms became commonplace, how they frame creative choices in the present, and what they tell us about how certain people have defined their relationships to each other and to technologies. We see that many of your influences stem from jazz. Jazz is known for incorporating particularly fragmented sound. Did that have an impact on your work as an artist? Yes, I grew up in a household that was immersed in jazz music. I learned music making, and piano improvisation in particular, almost before I learned to communicate with (other) language. Listening to jazz records fueled my curiosity about sounds; I have learned countless things about how sounds can be made and organized from the relentless inventiveness of jazz musicians. So, for one example, some of my favorite jazz albums are duets between Oscar Peterson and Count Basie on Pablo Records; I think about the ways that Peterson plays a cascade of about a hundred notes to Basie’s well-placed one or two, as well as the interplay of timbres when a piano is placed in conversation with a Fender Rhodes or Hammond organ. Also, it was through jazz that I first came to understand music as an archive of social history, a medium of personal and cultural expression, and a political tool. These things remain foundational to my research and teaching, as well as to my reasons for making art. What is the significance of combining both visuals and audio in your art? This was not something that I actively set out to do; it was an outcome of particular circumstances that resulted inongoing experiments. The first pieces I made that combined audio and visuals were “Places I’ve Lived & Traveled To” and “20 Largest State-to-State Migration Flows” in 2005-06. I was taking video classes in the MFA program at Mills College, and there was an analog video mixer available to students. It was kind of outdated, and not many people chose to use it. I became fascinated by feeding audio signals into the video input; it translated the sound waves as visible oscillations and presented several options for infusing them with color and changing how they were framed on the monitor. These color and framing options were precisely what made the mixer seem outmoded and tacky if you were working with video. But, for visualizing waveforms, I found these features to be quite elegant. From that particular tool and the possibilities that it opened up, I started asking questions like: What if we think of sound waves as a form of landscape? What if we could look out a window and see them passing by, and imagine running through them? And those sorts of speculative questions ended up informing the concepts and content of the pieces I made. My entry into converting digital photographs into sound was also largely happenstance. I was invited to do an artist residency for a week in 2007 at the Western Front in Vancouver. The residency carried with it an assignment to write a piece of music using a mobile phone. (It’s worth saying that in 2007, the options for doing that were exponentially more limited than they are now.) Nothing about that assignment seemed consistent with my way of working, until I realized that I could take photos with a mobile phone and use those as source material for music. This allowed me to push further on the questions of how to represent landscapes using sound, questions which I had begun to explore in the “Places” and “Flows” works mentioned previously. So, making the “Sonic Panoramas” of Vancouver (and later Montreal and New York) came out of this initial circumstance of needing to write a piece of music on deadline, using a mobile phone. As you can probably sense from my answers, sound remains central when I am making a project. I have been interested in what happens when sound is translated as or derived from another medium, like photography or video, but sound always remains “the thing”–my focus. Is there a specific concept or argument you are aiming to convey through your work? If there is a theme running through all of these works, it is that I am interested in using sound to prompt reflection on the interrelations among humans, other species, technologies, and environments. But I hope that the works are open to many interpretations. 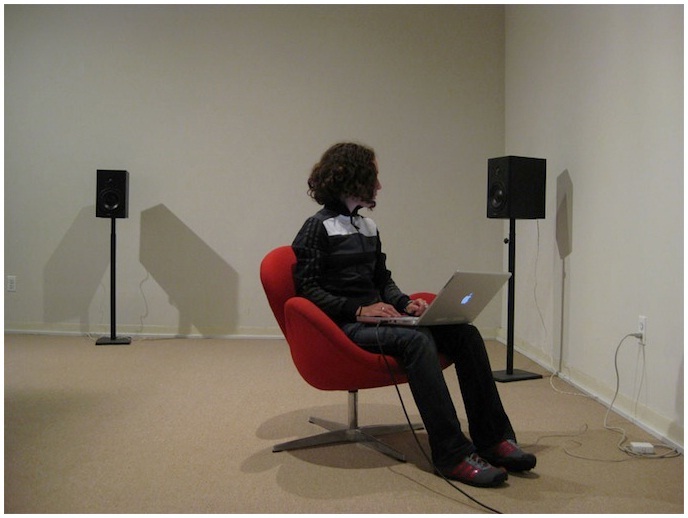 Many people encountering sound art, especially for the first time, find it all very abstract. So, I like to include program notes or wall text to indicate what I was thinking about when I made the piece, or to somehow demystify the process. However, I understand this text to be more like a starting point to dialogue with whomever is experiencing or interpreting the work, rather than an argument. For me, art functions as a counterpoint to my scholarly research, which conventionally requires more linear modes of argumentation. In contrast to that, I understand art as a place where one is free to set up a more speculative kind of oasis–like a set of generative relations that can hold tension and remain unresolved. I prefer not to convey an argument in my artwork; in most cases, I think that would be a failure of the work. Save the date to Patterns of Movement! Learn more about Tara Rodgers by viewing her award winning website or by reading a bird’s eye view of her exhibit written by Gabrielle Dunkley.